Rookie guard Donovan Mitchell added 25 points, including the basket that broke the tie with 39.2 seconds remaining and allowed the Utah Jazz to beat the San Antonio Spurs 101-99 and win the 10th consecutive win, best current winning streak in the NBA. Mitchel, who also captured seven rebounds, gave five assists and recovered three balls, scored the decisive goals in the fourth period that made it possible for the Jazz to overcome a disadvantage of 13 points. The rookie shooting guard of the season scored two baskets and a shot from the personnel line in the last minute of the game that left on the way to the Spurs, who before the game confirmed the loss of their leading scorer in power forward LaMarcus Aldridge with discomfort in the right knee. 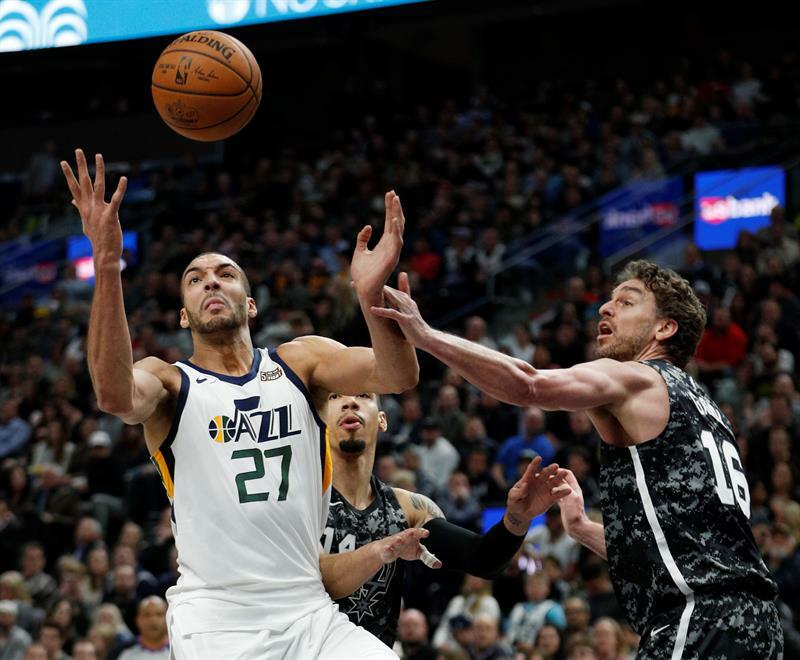 Along with Mitchell, the Australian forward Joe Ingles got 20 points, seven rebounds and five assists, while power forward Derrick Favors reached the 19 points and captured eight balls under the rings. Forward Jae Crowder, traded last Thursday by the Cleveland Cavaliers, made his debut with Jazz supporters and responded effectively again with 14 points and three rebounds. The Jazz, who played for the second consecutive game without Spanish starter Ricky Rubio, down due to discomfort in the left hip, put on a winning record (29-28) for the first time in more than two months and get back into the fight to be in the playoffs. Forward Kyle Anderson, who is still in the starting role of stellar Kawhi Leonard, was the Spurs’ top scorer with 16 points. But the Spanish center Pau Gasol, with a double-double of 15 points and 15 rebounds, including 12 defensive, ended up being the most consistent and complete player of the Spurs (35-23), who lost the second consecutive global game and the third in the duels that both teams have had this season. Gasol played 33 minutes as a starter, after having been a substitute in the last two games, he scored 6 of 14 field goals, missed the two triple attempts he had, and scored 3 of 4 from the personnel line. The player of Sant Boi also stood out with six assists, recovered a ball, lost another, put two plugs and the referees pointed out three personal fouls. Gasol reached the twelfth double-double he has achieved so far this season. While the veteran Argentine guard Manu Ginóboli, who tried a triple in search of the miracle before the horn sounded, managed nine points in the 22 minutes he played. Ginobili scored 3 of 10 field goals, with a triple of five attempts, and 2-4 from the line of personnel, in addition to capturing three rebounds (defensive), distributed two assists, recovered two balls, lost three and committed two personal fouls .